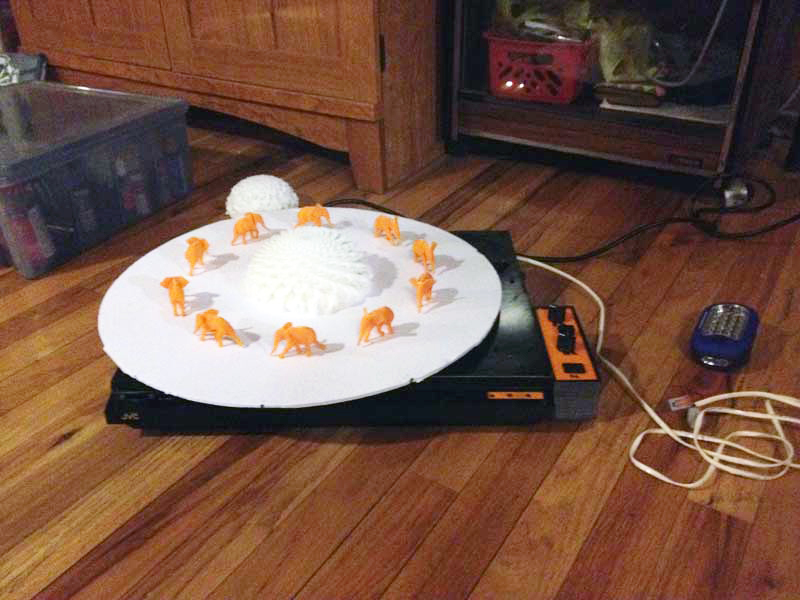 A project to convert an old record player into a controllable turntable for physical 3D animations. a 19th-century optical toy consisting of a cylinder with a series of pictures on the inner surface that, when viewed through slits with the cylinder rotating, give an impression of continuous motion. This essentially describes a looped version of a flip book. Unlike a movie filmstrip, which runs from beginning to end at a continuous speed and can show a long animation, the rotating cylinder in a zoetrope requires that the last image loops seamlessly back to the first image. That implies a rotation device of some sort. In a traditional zoetrope the impression of a continuous animation comes about when the viewer only sees one image at a time without actually seeing the change to the next image. This is usually achieved with a mechanism that shuts the viewing slit while the change takes place. If this is done quickly enough – 12 to 16 images (or frames) per second – the viewer sees the individual images as a more or less seamless animation. In a classic movie film projector a strip of plastic with small pictures scrolls in front of a strong light, which projects the picture on a canvas. The film strip was moved by a hand crank in early devices and later replaced by electric motors. Mechanically coupled to the rotating spools which contain the filmstrip is a small propeller-like piece which covers the light bulb while the next image is pulled in front of the light. What makes a device like that 3D? While the traditional zoetrope and film projectors use images that could be hand drawn or recorded with a film camera and therefore are 2D, taking this idea to 3D requires actual real objects. This real 3D version is not to be confused with modern 3D movies which use various optical gimmicks tricking the viewer to experience a more or less convincing 3D effect. The 3D zoetrope is a wonderful combination of down-to-earth basic technology with modern digital electronics. The old-meets-new charm here is that instead of drawing pictures by hand we use 3D printing to produce interesting objects for our 3D zoetrope.